ELIZABETH CITY, N.C. – Halloween is here! We’ve been preparing all month for this holiday by carving our pumpkins and putting last minute details on our costumes. It’s time for the little ghouls and ghosts to come out this Saturday and get all the candy they can dream of, but it’s important we remind our kids to be safe too. Halloween can be dangerous, but we these simple Trick or Treating Safety Tips for a Frightening Good Time you and your little ones will have a great Halloween. Adult supervision is a must. Any kid under the age of 12 should have a parent with them no matter where they are trick or treating. If your children are over the age of 12, make sure they are going out with a group and stay with that group. Stay in a safe neighborhood that’s well lit. It’s ideal to trick or treat in an area you’re familiar with so you don’t get lost. A safe bet is to look at porch lights; if they’re not lit, chances are they’re not handing out candy. Always use sidewalks and crosswalks. It’s harder for drivers to see at night, so make sure your kids stick to recommended walking areas. Teach them to make eye contact with drivers before crossing so they are aware of each other. Light up with glow sticks and reflective tape. The best glow sticks to use are the necklaces so little ones can’t lose them as easily. This makes your child easier to see by you and drivers. Reflective tape can easily be put on candy buckets and bags too. Inspect any goodies your child receives. The candy should be factory wrapped with no tampering whatsoever. It’s suggested to avoid homemade treats as well. Never enter a house. Houses should only be entered if you are with your child and you know the person. Same goes with cars, no child should ever get near or in a car with a stranger. Costumes should fit comfortably. This includes masks, shoes, and any other accessories. Big costumes can become a tripping hazard and big masks can be hard for children to see in. 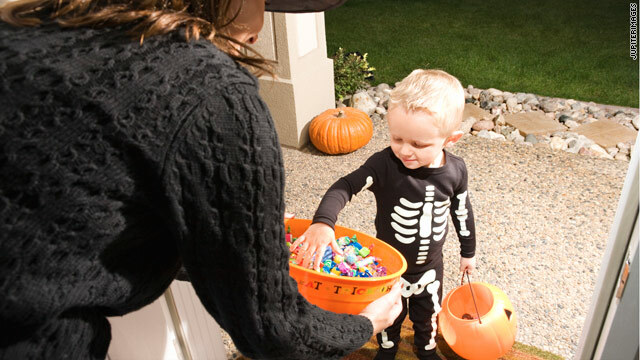 Stick with these Trick or Treating Safety Tips for a Frightening Good Time this Halloween. Check out our fun Halloween event at Perry Auto Group too. Trunk or Treat is happening Friday October 30th from 5-8 p.m. Bring the family out for a good time at our Chrysler and Chevrolet dealership.